When organization is your top priority, expanding files are a necessity. And when your office space (whether at home or at work) is cluttered, expanding files will come to your rescue. These life savers will do exactly that. With these expanding files, you no longer have to worry about not being able to find your papers, receipts, coupons, or checks! We've categorized by pocket numbers. So when you know exactly how much space you need, click on the right choice for you. And when you look further, you'll find that our choices come in different sizes and different colors. So it'll be easy to match your office style! 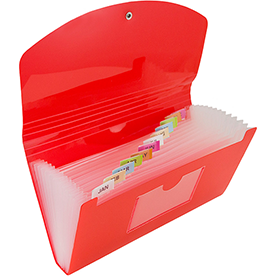 Try our 6 Pocket accordion Folders if you are in need of storing coupons or receipts. Coming in coupon and letter size, so you will be able to store even more. 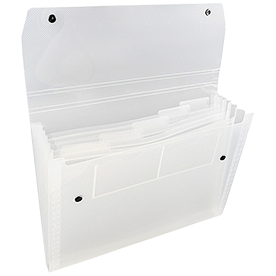 If you need a lot of space and even more organization, try our 13 Pocket Accordion Folders. These come in sizes: check, letter, and legal! And in a wide variety of colors too. These are so valuable that youÃƒÆ’Ã‚Â¢ÃƒÂ¢Ã¢â‚¬Å¡Ã‚Â¬ÃƒÂ¢Ã¢â‚¬Å¾Ã‚Â¢ll want to stock up! Choose one for home and one for the office, or one for your scrapbooking material and one for your legal documents. Whatever way you want to use it, it'll make any situation more organized and cleaner. So start shopping now!